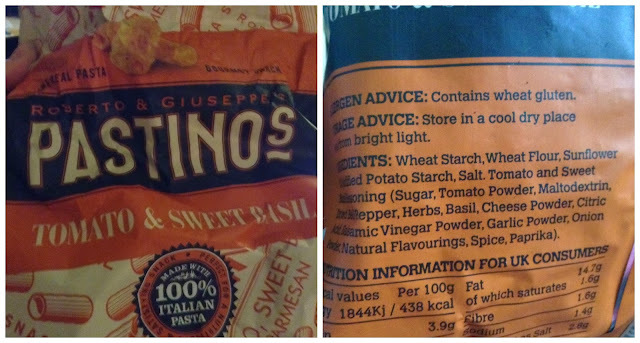 At the weekend, I came across Pastinos snacks in a variety of flavours. I admit I quickly glanced at the Allergen Advice saw it did not contain milk and threw them in my basket. When I opened these up and tasted, something did not sit well with me in terms of taste and then I spotted CHEESE POWDER. Alarm bells went off and I thought "do these contain MILK?". I am hugely concerned about the label on this packet. I wrote to the Company for clarification about the presence of milk and here is the response. "Thanks for pointing this out and you are quite correct. We hope this has not inconvenienced people. Our Tomato & Sweet Basil product does contain milk, as an element of the cheese powder ingredient. Non of the other four varieties contain milk and the only allergen advice refers to Wheat. We will change the ingredients list in the next print run and, in line with latest BRC advice, move to emboldening all Allergen references in the ingredients list. 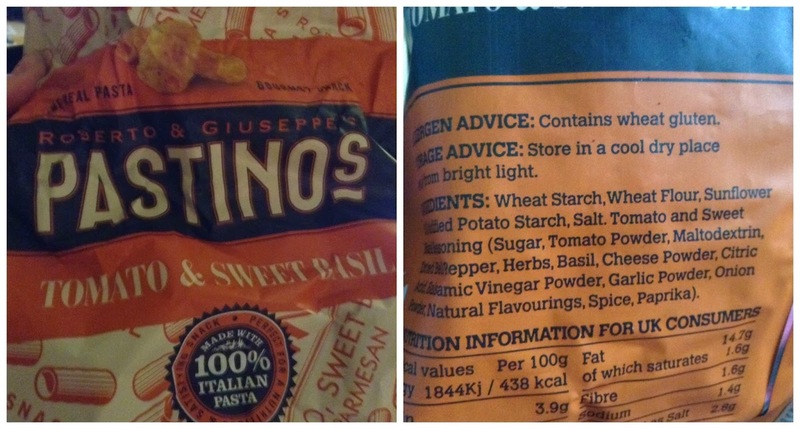 This will embolden “wheat” in all the products and well as inserting an emboldened “ (Milk) “ after “Cheese Powder” in the Tomato & Sweet Basil variety"
I am not an expert when it comes to labels and have no idea whether they have done anything wrong in terms of breaking labelling laws. I wanted to put this out there because I fell into that trap of being in a hurry and taking what I see for granted. I've started to put my trust in the Allergen Advice which is wrong of me. Please don't make the same mistake as I did, read those labels a million times, something which I need to get back into the habit of doing. I have written about the new allergen labelling here. Maybe the new labels will be a good thing after all? They've not done anything wrong, but including 'contains wheat' in the allergen box and failing to include 'contains dairy' is what the lawmakers would call poor practice - and rightly so. They also don't need to use the word 'milk' as they've used 'cheese' (ditto cream and yoghurt, were they present). The good news is that they're soon to be moving to new labelling with a bold milk, but it's still a sobering reminder that those with sensitivities need to be on their guard. Thanks a lot for this post. I am allergic to milk and admit I have become lazy of late, skipping straight to the allergens listing and bypassing the ingredients. (This is actually because I've been quite impressed recently at the way labelling is making this more obvious). This is definitely a reminder to check both. Good that they are going to fix it! I hate when this happens, I feel like brands seem to forget that people can have dairy allergies or intolerances and tend to just label all the other products that can cause allergies! I'm not horribly allergic either but I do have issues with milk/milk products and I try to be very careful about reading labels--they're not always very transparent about the ingredients! !